​Adding black patina to your stained glass projects can really make the glass colours ​come alive. In fact, I use black patina on about 90% of my copper foil creations because it leads the eye to focus on the colours and design of the glass, instead of the solder lines. 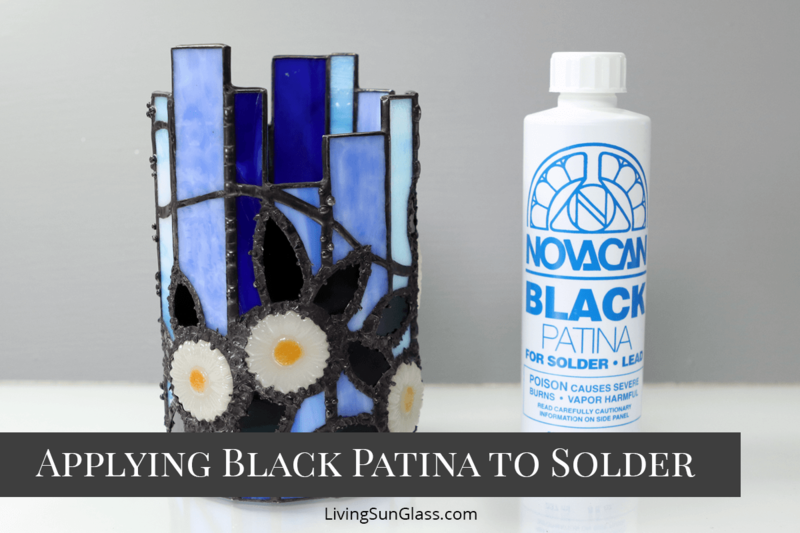 The video shows step by step how to enhance your stained glass work with black patina, which products I use and how I ​use them. It's a very simple process, and the video will show you how to apply black patina for a consistent, even colour on your copper foil stained glass projects. ​When the tutorial for this candle/lamp project and the fused glass daisies become available ( in June 2018,) ​you'll find a link to them here. ​Do you have tips that work really well for you when using black patina? Add them to the comments below so everyone can see what works best for you! Once the patina is cleaned and dried, how can you polish the piece without the color of the patina fading? Hello Maryam. In my experience, the patina always fades a little bit due to polishing. In many ways, I love the look it gives. The highest points that get the most rubbing from polising are a little lighter than the rest creating natural higlights. Try not to think of patina as paint as it is truly more of a tint. So black patina creates a darker tint to the solder as opposed to paint that creates a complete’y opaque black mask on items it’s added to.